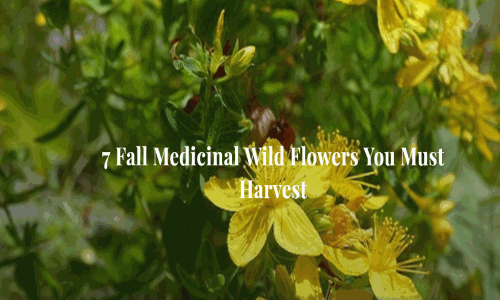 It’s important that you know what’s available in your backyard that can be used medicinally, and this is our article for today. We’ve been using plants medicinally in this country long before it was settled by Europeans. 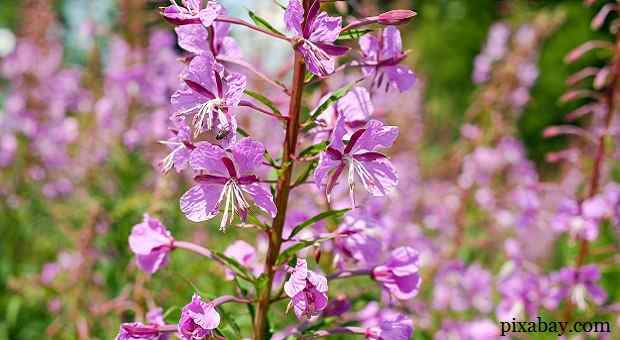 As a matter of fact, many of the plants were originally named by Native Americans, then the name was Anglicized. They had herbal medicine down to an art and with just a little bit of time, you can build some rudimentary skill in this area. And you should. I’m sure that the last person who ended up in some tragic scenario that required this kind of knowledge didn’t plan to end up in that situation, either. Now, just to throw in a bit of trivia about the names of plants. As I said, many of them were named by Native Americans or by the settlers. Those are the pretty or descriptive names like Butterfly Weed or Indian Paint, or Church Steeples. Others, such as hepatica, were named during a period of time in the middle ages when doctors believed that the structure of a plant belied its use. For example, the hepatica plant was believed to aid with liver ailments because the flower itself had three lobed leaves that reminded the doctor of the human liver. It turns out that the plant doesn’t really have any medicinal properties at all. Fortunately, we’ve moved a little bit beyond that. Coming back to the US, though, once Europeans started settling and learning from the Native Americans about the plants, they combined their advanced knowledge of human anatomy and medicine with their new knowledge and the modern pharmaceuticals were born. Even today, flowering plants provide almost 25% of the basic ingredients for today’s medicines. Now, let’s get to what you should be harvesting for winter. This beautiful flower comes in lavender, white, pink, red, yellow, and purple flowers that grow up a stem that can get as tall as six feet. They grow well in many parts of the US and are used medicinally for congestive heart failure and dropsy, aka fluid retention. 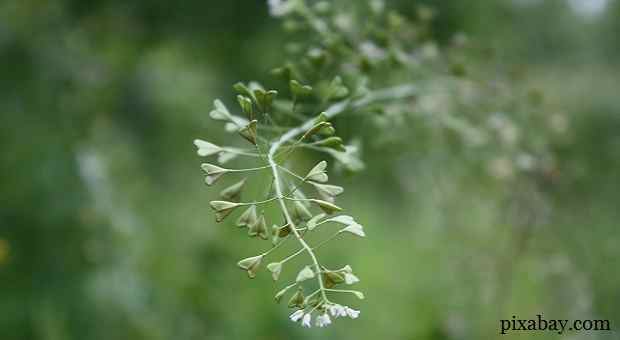 It’s also used for asthma, heart irregularities (flutters), constipation, headaches, tuberculosis, and epilepsy. This pretty purple plant is grown by the front porch or gat for luck, but that’s not all it’s for. 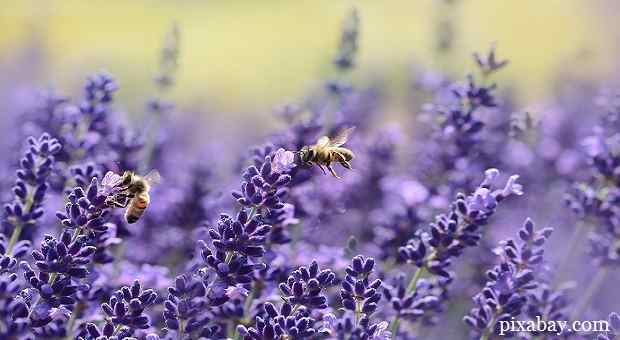 Lavender makes a great tea and is shown to be effective in treating depression, anxiety, and stress-related headaches. Store the plant, stems, and leaves. This plant was carried to the US from Europe and grows well here throughout the country. The whole plant is edible and also extremely nutritious, but the health benefits make it a must-have in your medicinal herbs kit. The leaves, stems and flowers are used to stop bleeding because it constricts your blood vessels. It’s also used as an astringent and an anti-inflammatory. You can make it into a tea for the medicinal purposes. You may be better off making this into a tincture because it’s possible that they lose potency when they’re dried. Every single part of this pretty plant has a medicinal use. The seeds are cultivated because they contain GLA, one of the essential fatty acids that your body can’t make. It helps prevent heart disease, cirrhosis of the liver, skin conditions such as eczema, atherosclerosis, menopause, and PMS, which will definitely be a good treatment for all involved if you’re forced into tight quarters! Seriously though, it’s a nice tea that’s used to relieve that discomfort. The plant is used to relieve pain and is an anti-inflammatory. The leaves and bark are astringent and can also help with whooping cough, asthma, skin condition, and GI disorders. Now see why it’s a must-have? Harvest extra! This flower is so pretty that many people are growing it in their gardens without even realizing that it’s a medicinal plant. 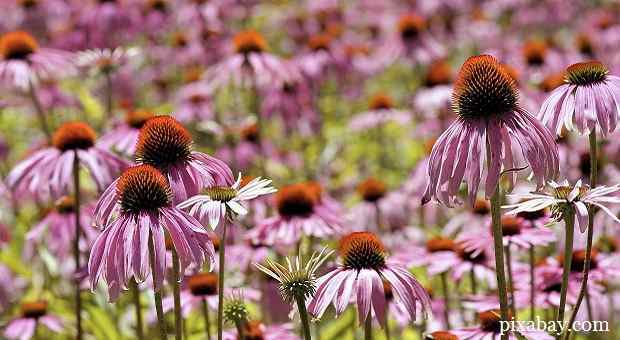 As a matter of fact, you probably recognize this plant better by its Latin name: Echinacea. This was probably the plant that was used the most by Native Americans. They used the root for snake bites, bug bites, burns, toothaches, sores, colds, and flu. All of the plant – leaves, buds, stems, and roots, are all potent, but the highest concentration is in the black roots, which can be dried and ground into a powder for use in tea. 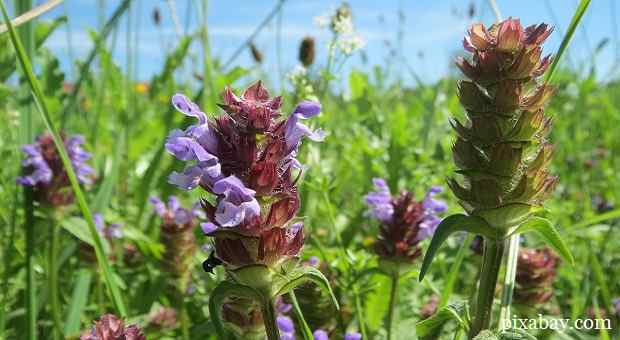 As with many plants, this ground weed with small purple flowers is being studied by traditional medicine for its efficacy and is showing great potential for its antibiotic capabilities. It’s so prolific that you can find it just about anywhere in the US. This is a common roadside weed in almost every state, though most people have no clue what it is. 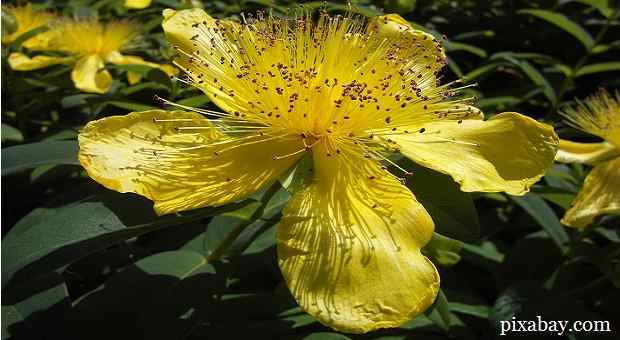 It has what can only be described as frothy yellow flowers and gardeners call it a weed and pull it out mercilessly. It blooms in the summer and is always in bloom in late June. As a matter of fact, that’s how it got its name back in medieval Europe: The Day of St. John is on June 24th. Then, it was used to ward off evil spirits and protect livestock and farms from devils, goblins, and witches. Today we just use it to treat depression and anxiety. Boring, I know, but a better use of the plant. As a matter of fact, it’s so effective that it’s often called natural Prozac. These are the most popular plants that are fairly common throughout the United States and there are likely some plants native and specific to your zone that you should learn about, too. All of the plants that I listed here are fine to be dried, except where noted, but some plants lose their efficacy when they’re dried. For those, you’ll want to make a tincture, infusion, or salve instead, depending on whether you take it internally or externally. You just can’t skip these natural cures from your prepping, as they are right at your hand and so much more powerful than anything that Big Pharma would promote. Take advantage of them to stay safe! 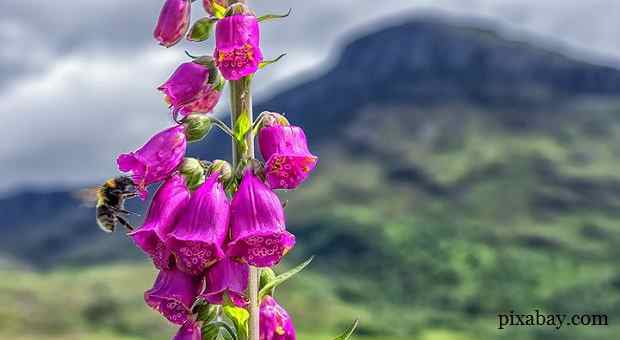 Do you have any wildflowers that you’d like to suggest? If so, please do so in the comments section below. Previous PostHouston Flooding Catastrophe – Do you have a plan if this happens in your area?